Le Club Accorhotels members can earn double points for weekend stays in Moscow March 12 – April 30, 2015. The offer is valid for stays at two ibis hotels in Moscow for reservations booked between February 20 – April 30, 2015. Note that this offer is valid for stays on Friday, Saturday and Sunday nights. An offer to keep in mind if you are planning to stay in Moscow this coming spring at any of the two ibis hotels there. 1. 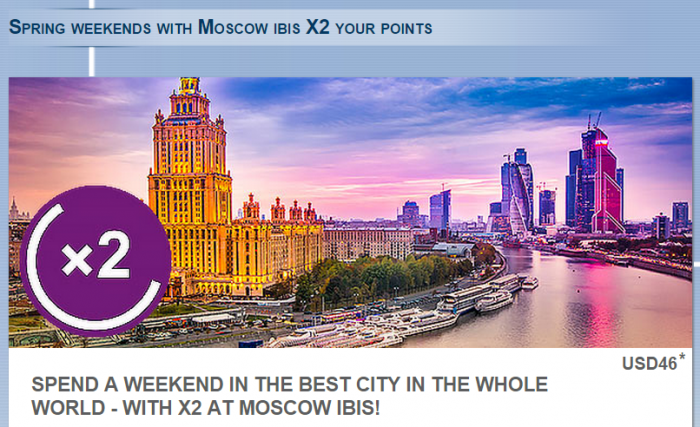 General Le Club Accorhotels terms and conditions apply to the “Spring weekends with Moscow ibis X2 your points” offer. 2. This offer is valid for a stay from 12.03.2015 and 30.04.2015 in participating hotels ibis in Moscow (7140, 8221), and booked between 20.02.2015 and 30.04.2015. 3. This offer entitles Le Club Accorhotels Loyalty members, regardless of their status, to benefit from earning double points in one of the above mentioned participating hotels in Russian Federation. 7. This offer cannot be combined with other current promotional offers or advantages and does not apply to groups. 8. This offer is subject to availability. General sales terms and conditions apply for reserved public rates specific to each hotel. Some bookings can be modified or cancelled. 11. The offer is applicable for stays from Friday to Sunday. *Conditions apply. Validity depends on room availability. See conditions for each hotel when booking.